“An art exhibit currently showing in New York imagines video game scenes as if they were religious frescoes from the late Middle Ages. 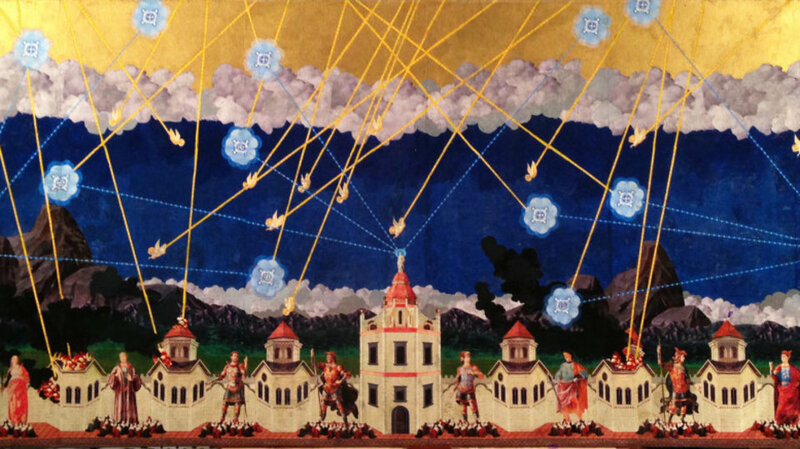 The one shown here is “Defenders of Ataros,” by Dan Hernandez, plainly referencing Atari’s Missile Command. It’s part of “Genesis 2014,” showing now at the Kim Foster Gallery in Chelsea. Hernandez, notes the Gallery, mixes religion, mythology and pop culture in his work. “Hernandez blurs boundaries, rearranges hierarchies, and calls into question our notions of iconography, collectibles, violence and devotion,” the gallery says.